A split screen would be nice. You could be at two places at once on map. It would be very nice for use to watch for raiders. 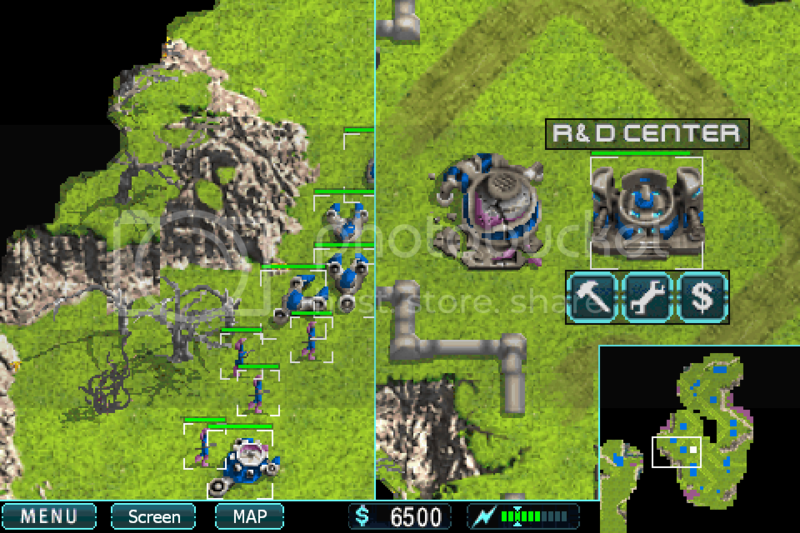 A player could toggle the split screen by pressing the screen button. The size of one of the screens could be changed. Dragging the divider to the left, would make the right screen larger and the left screen smaller. The minimap could be toggled on/off with the map button. Iphone is too small/no work is being done right now sorry. Instead of a screen divider, we could have unit groups instead, numbered 1-5. You can map groups of units with a certain number (like 1, for instance). If you tap the "1" button, you'd select the units you mapped to "1". Double tapping it would snap your screen to where your "1" unit group is on the map. O yeah like empire earth and stuff like that, I love games that do that. To quickly pick what units you want in a group, when you do a multi unit select, you could tap an unassigned number to assign the selected units to that group. To remove units from a group and make that number button unassigned, you could hold the button for 3 seconds. Perhaps there's a mod for iPads on Cydia to split screen two different games? Yeah it would work a lot better on ipad. Why should galm be sorry? For not having a bigger iPhone screen. We all need to work together if we're to make a difference guys! I don't have an iPad, but Quasar looks like it would do the trick. You'd need two or more installations of WI on the device though.